Alfred Covell Woods is listed as Clifford Woods on the regimental sheets and is cross-referenced as Alfred Covell Woods, he enlisted as a private in Captain N. Hathaway's Company, Anderson's Zouaves, NYSV at the age of 18, May 1, 1861. He enrolled June 30, 1861 New York City for 3 years service, he mustered in at Saltersville, N.J. on July 3, 1861. Capt . Hathaway's Company became Company C, 62nd NYSV, Alfred Woods was transferred to Captain Miles L. Riggs' Co. E, Anderson Zouaves Regt, NYSV on June 30, 1861. 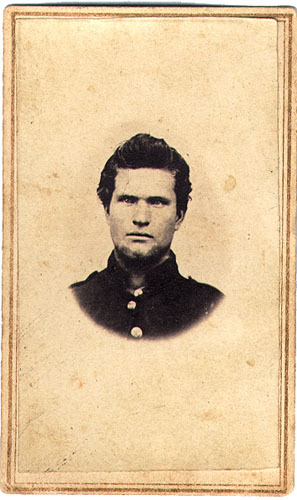 Alfred Woods was promoted to Corporal, Co. E, on December 1, 1861. Alfred Woods was marked absent sick from his regiment at Harrison's Landing with leave from the regimental surgeon during the period from April 30, 1862 to August 31, 1862, Alfred Woods letters indicate that as of July 7th, 1862 he was at Harrison's Landing and in "tough and hearty" condition. Alfred Woods diary shows him present through June 29, 1862, also possibly August 11-14, 1862, this sickness may explain his "return" to the regiment at Harper's Ferry on October 27, 1862. Alfred Woods was marked as present from September to October, 1862 through his death on 5 May, 1864. Alfred Woods was promoted to 5th Sergeant, Company E on January 8th, 1864; the position in which he was serving when killed on 5 May, 1864. Per Section VI, NYS 1865 Census : "Place of burial unknown. Supposed to be buried on the field." May be one of the nearly 13,000 unknown soldiers re-buried at the Fredericksburg National Cemetery.